This is a limited edition seed that has a unique scent and flavour and due to its early finishing side has been a great influence on the practical Haze hybrids. There is a particularly unique flavour accompanied with the Early Queen side of this hybrid and with some fair selection there is be a real gift waiting to be found. It will be a very easy and rewarding plant for all - without compromise. 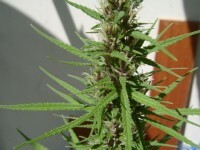 Earlier phenotypes of this hybrid will be completed by 8 or 9 weeks and 11 weeks for the distinctly unique flavored phenotypes. Prefers outdoor and greenhouse giving above average yield. This is selected for the alleviation to medical symptoms and pain management.